La Folia is a music production company that brings together instrumentalists, singers, actors, dancers, visual artists and writers to create new music, original projects and ground-breaking performances. La Folia began as Sarum Chamber Orchestra, and has performed classical concerts for over 25 years. It continues to do so under its new name. La Folia has a long history of creating large-scale projects and have developed a programme which has gained a reputation for innovation and best practice both in mainstream and special education. We were asked to produce a new website to replace the existing site, bringing content, design and functionality bang up to date. With an updated logo, colours and brand the site needed to reflect the organisation’s professionalism, diversity of work and be manageable for the client themselves. 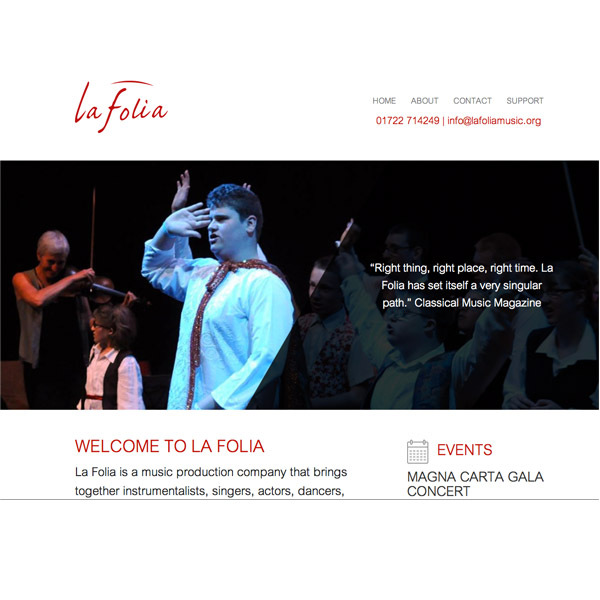 We designed the website to give a ‘classy’ and ‘high quality’ look to the organisation and focussed on presenting La Folia in the best light and to encourage site visitor contact. The new branding was incorporated throughout the site so that it was consistent. The design is fully responsive and scaleable so that it is easy to navigate on any device (eg. phone, tablet,large screen) providing a website that will continue to be effective for years to come. We incorporated dynamic content like news and event scheduling with features like audio and video embedding supported as required. The site was built with a Content Management System (CMS) so that the client can update the content with ease. ‘Transforming music ‘ is La Folia’s strap line; ‘Transforming websites’ could well be Addison Design’s! They have indeed transformed the La Folia website to reflect the scope and vitality of our work and we are proud to direct our contacts there. Our ‘transformation’ journey has been only positive from the initial contact, throughout the build, to delivery and the ongoing service we receive. Addison Design has a particular blend of friendliness and efficiency. Communication is always focused, relevant and timely, and it is a pleasure to call in personally to their studio, whether it be with a quick question or for a detailed consultation. We could not ask for better service.